PRUNEDALE, Calif. -- A rescue team was dispatched to the Elkhorn Slough in the Prunedale area of unincorporated Monterey County Saturday morning to assess the condition of a stranded dolphin, according to a spokesperson for the Marine Mammal Center. 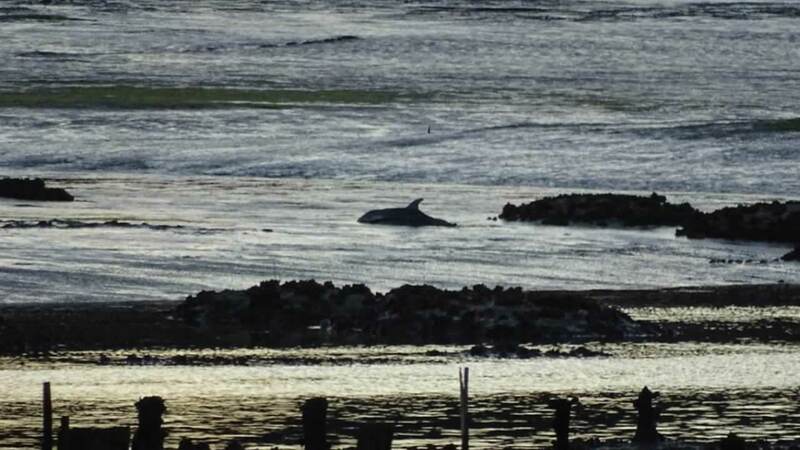 The Marine Mammal Center says a pre-weaned dolphin calf stranded in Elkhorn Slough was first reported Friday morning. Late in the afternoon the Center received reports that the animal was stuck in the mud, and sent trained rescue personnel out to assess. Rescuers were unable to get close to the animal for assessment or rescue due to the unsafe conditions that the mud had created. On Saturday morning, a trained rescue team arrived to reassess the animal's condition. At that point the animal was swimming in the water so the rescue team from the Center requested authorization from the National Marine Fisheries Services to attempt a water rescue. As a pre-weaned calf, the animal is completely dependent on its mother for survival, so multiple attempts were made to locate the animal's mother, including a boat survey of the surrounding area, as well as a flyover by the United States Coast Guard. Unfortunately all attempts to locate and reunite this calf with its mother were unsuccessful. The dolphin calf is in deteriorating condition, likely due to the length of time it has been separated from its mother or possibly from other underlying problems that potentially predisposed it to stranding. The rescue team transport the animal to the Center. the center says at this point, the prognosis is grave due to the length of time it has been stranded.